Residents may drop off TV’s, old computers, monitors, keyboards, printers, etc. 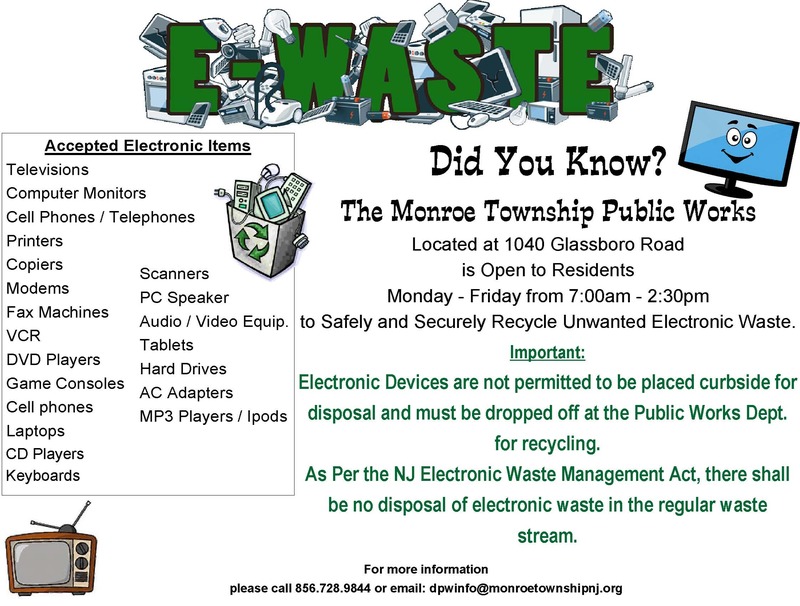 to the Monroe Township Department of Public Works, Monday – Friday, 7 a.m. – 2:30 p.m. to be recycled. TV, Computer parts & supplies will NOT be collected curbside for recycling. RECYCLABLES ARE COLLECTED EVERY WEEK ON YOUR DESIGNATED PICK-UP DAY. You may drop off any of the following recyclables at the Public Works Dept. located at 1040 Glassboro Rd., Williamstown, between the hours of 7 am and 2:30 pm, Monday through Friday: paper, cardboard, aluminum & steel cans, glass bottles and jars, plastic beverage, food and detergent bottles, used motor oil, automotive batteries, appliances and lite iron. Please notify the Public Works Dept. prior to drop off. Glass Bottles & Jars, Tin & Aluminum Cans, Plastic Bottles, Paper and Cardboard are collected weekly. NOTE:You may commingle your glass bottles, jars, tin, aluminum cans, plastic bottles, paper and cardboard in one container. Recycling containers should not exceed 35 lbs. in weight. Recycables are to be placed curbside by 6:30 AM on your designated pick-up day. Place them so they are easily seen from the roadway and set away from your regular garbage. Do not put recyclables in plastic bags!! of your automated trash container there should be a four foot clearance around the container. Please ensure the automated container is set away from utility poles, mailboxes, vehicles, basketball nets, recyclables, “odd stops”, etc. Receptacles or other items to be disposed of shall be placed outside the designated area after 6:00pm of the day immediately preceding the day of collection. After collection, any empty containers shall be removed from the curbside promptly, but no later than 8:00pm the day of collection. There shall be no collection of commercial trash or construction debris by the Township of Monroe as defined in Chapter 239 of the Monroe Township Code. COMMERCIAL TRASH – Any debris, garbage, or trash not created by household consumption or use or any other debris, garbage, or trash such as building materials and other discarded items not normally accumulated through household consumption, even if such debris was generated by a household. CONSTRUCTION DEBRIS – Debris that is generated by a contractor or by an occupant. A dumpster will be required on site during all phases of construction or demolition. The Construction Code Official will advise of dumpster requirements at the time of permit application. Glen, Star Harbor, Sicklerville Rd. from Sicklerville Rd. to Winslow Line, Nationwide, Fries Mill Rd. from Rt. 322 to Glass. Xkeys Rd., Pitman Downer Rd., Rt. 322 from Rt. 555 to Glassboro Line, Rt. Thanking you in advance for your cooperation! !